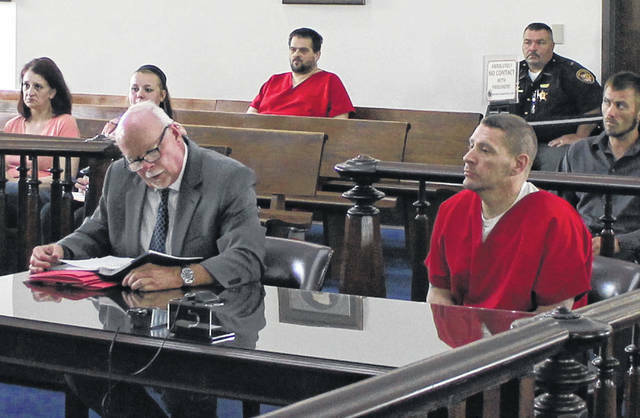 Steve Davis, right, sits in Highland County Common Pleas Court on Wednesday with attorney Bill Armintrout. A jury trial was rescheduled Wednesday for a man accused of bringing a dead body to Highland County and dumping it in a field. Steve A. Davis, 40, Batavia, is charged with two other men for allegedly killing a man in Clermont County, then bringing his body to Highland County and disposing of it in a field near New Market. Attorney Bill Armintrout, representing Davis, requested his client’s trial be delayed from its original date of Monday, July 9, due to the significant amount of evidence in the case. Armintrout added that Davis does not wish to sign a document waiving his right to a speedy trial. According to Ohio law, statutory speedy trial rights require that defendants charged with a felony be brought to trial within 270 days, although each day spent in jail counts as three days on the timeline. Davis was arrested Tuesday, May 8 in Brown County, and has remained incarcerated since then, making his speedy trial deadline Aug. 8. Judge Rocky Coss granted the request on Wednesday, rescheduling the trial for Monday, July 30. A pre-trial hearing will be held at 1 p.m. Monday, July 16. Coss said he granted the request due to the unusual amount of evidence in the case. As previously reported, Davis, Stoney James Behler, 37, and John Daniel Disney, 39, both of Cincinnati, were each indicted in May on one count of involuntary manslaughter, a first-degree felony, one count of tampering with evidence, a third-degree felony, and one count of abuse of a corpse, a fifth-degree felony. Behler was indicted on one additional count of having weapons under disability, a third-degree felony. The charges are related to the death of Dakota Spurlock, a 24-year-old Clermont County man whose body was found in a field near New Market in February. Spurlock’s body, which was discovered by a farmer at the entrance to the field, had sustained a single gunshot wound to the chest, officials said. Highland County Sheriff Donnie Barrera said investigators believe Spurlock was killed in Clermont County, then brought to Highland County and dumped in the field. The sheriff would not disclose a motive. Disney and Behler were initially incarcerated at the Clermont County Jail, but online records no longer show them as inmates. Both of their cases are pending here. As previously reported, online court records in Clermont, Hamilton and Montgomery County show Spurlock had a criminal record, including drug crimes and firearm violations. A Facebook page appearing to belong to Spurlock showed him and others in multiple photos holding guns and wads of cash. Also Wednesday, a Bainbridge man pled guilty to aggravated possession of methamphetamine, a fifth-degree felony, unauthorized use of property, a fourth-degree felony, and theft, a fifth-degree felony. According to court documents, Johnathan Knauff, 43, stole a bulldozer in the Pike State Forest area, took out several trees in the forest and cut firewood from them. Court documents say when Knauff was confronted by a person in the area who was familiar with the owner of the bulldozer, he said he would give them money if they didn’t tell the police. The drug charge, filed in a separate case, stems from a separate incident in which Knauff was pulled over and allegedly had methamphetamine in his car. Coss ordered a pre-sentence investigation be completed. Knauff will be sentenced at 9 a.m. Wednesday, Aug. 1.